Canadian plane and train maker Bombardier has unveiled a plan to set up a railway cluster in Morocco to serve as an industrial platform to provide services to African countries. The goal of Bombardier Transportation cluster to be established in the North African Kingdom with its leading industrial suppliers is provide African markets, as well as some European countries with railway equipment. This project has been announced by Head of Bombardier Transportation in Morocco Taoufiq Boussaid. He said his company wants to build 40,000 m2 industrial units, set up an engineering center in Casablanca, create 600 direct jobs and transfer its know-how in the sector to Moroccans. The Montreal-based aerospace company had already invested $200 million in manufacturing facility in Morocco. With this investment, Bombardier helped to develop a manufacturing competitive capacity that provides solutions to African aircraft market. 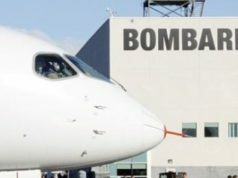 Bombardier says it choose to invest in Morocco for its political stability, its competitive manufacturing costs, low shipping and transportation costs and proximity to Europe… All these factors will help the North African country to serve as a springboard to the rest of the region. This upbeat vision is shared by U.S. giant Boeing which announced last month its own “Boeing ecosystem”, a project aims to bring around 120 suppliers of the company to help raise Morocco’s aeronautics exports by $1 billion and create 8,700 jobs. Boeing also pledged to attract its suppliers to boost the kingdom’s aeronautics industry. The US plane maker already has a joint venture with France’s Safran in Casablanca to build wire bundles and harnesses for aircraft makers, including Boeing and Airbus. Moroccan aeronautic industry is growing rapidly and continues to attract foreign investment. The sector, which employs 11,500 people, achieved last year exports worth $1bn. The sector has been growing at 15 per cent a year. The country aims to reach 23,000 jobs by 2020, increase exports to $1.6bn per year and increase to 35 per cent the proportion of locally-produced components, in what are mostly products assembled from imported parts. Written by: Peter Mulvany on October 21, 2016. Posted by Peter Mulvany on Oct 21 2016. Filed under Finance, Headlines, World News. You can follow any responses to this entry through the RSS 2.0. Both comments and pings are currently closed.